Monrovia, September 27, 2018:On Thursday, Liberia joined many countries to celebrate World Tourism Day under the national theme “Tourism and Digital Transformation”. The day's activities were jointly organized by the Ministries of Internal Affairs and Information, Cultural Affairs & Tourism. Deputy Internal Affairs Minister for Urban Affairs Honorable Paulita C.C. Wie represented Minister Honorable Varney A. Sirleaf at the event. Scores of officials of the MIA including the Women’s Association, County leaders along with traditional leaders graced the occasion. Speaking at the well-attended occasion, Honorable Wie committed the Ministry of Internal Affairs through the Department of Urban Affairs to continue working together for progress and decentralize tourism throughout the entire country. According to a press release from the Ministry of Internal Affairs, the Deputy Internal Affairs emphasized those beautiful and historical places, which when explored, will generate more revenues to the Government and people of Liberia. She said people around the world would pull into Liberia if the tourism industry is given the need attention by investing in the rich sector. 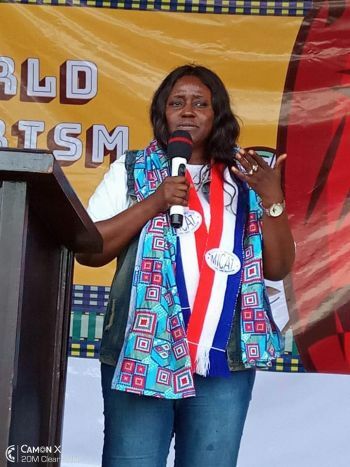 The release said Honorable Wie also noted that investment in the tourism sector of Liberia would make people of the world to visit the Country and appreciate the beautiful culture and tradition of the Country. Meanwhile the Honorable Wie commended the organizers of the Ministry of Internal Affairs and Information for the collective efforts that gave the celebration fruitful result.